Nuneaton Town have signed Stoke City Under-21s right-back Elliot Wheeler on a three-month youth loan. Wheeler, 21, becomes struggling Boro's third signing inside the last week. Boss Liam Daish, who went down with Ebbsfleet in 2013, is bidding to avoid a second relegation from the Conference top flight in three seasons. 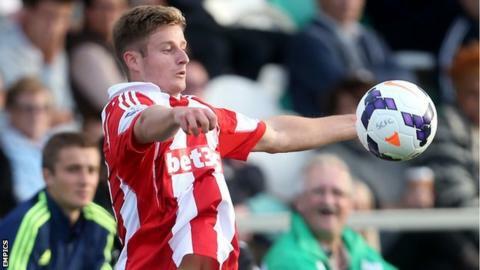 Isle of Wight-born Wheeler is in his second season at Stoke, having been previously at Portsmouth. He is yet to make his debut in League football. Daish also brought in Barnsley's George Maris and Notts County midfielder Elliott Whitehouse, who both played in Saturday's 1-0 defeat at Forest Green. Nuneaton's other January window signing was 19-year-old former Bristol City trainee midfielder Gus Mafuta, to offset the loss of Lee Fowler to Crawley Town. Boro have now lost their last four matches, three of them at home, to stand just a point clear of bottom club AFC Telford.